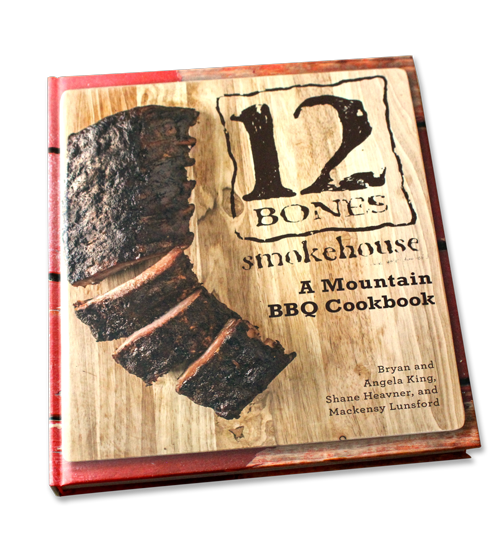 For lovers of 12 Bones Smokehouse, as well as fans of progressive ‘cue, our cookbook includes signature recipes and techniques for ribs, pulled pork and all the fixin’s. Available at both 12 Bones locations! Over the years we have been asked some pretty funny questions at the restaurant: Are these old family recipes? Did President Obama have to pay for his meal? Can you ship ribs to California? What is that spice in the cornbread? Was this building underwater during the flood? You’ll find most of the answers, at least regarding the recipes, in our cookbook. Some of the recipes honor old family traditions, some are stolen from former places of employment and some are pure “I-need-a-special-for-today” last-minute genius. 12 Bones has always been about the food and not much else. Luckily, when you open a restaurant focused on flavor alone, it is easy to inspire your staff as a team. And when you’re on the 12 Bones team, we don’t care if you have neck tattoos or wear a “Mullet Styles of the World” T-shirt, just as long as you can expertly prepare our delicious ribs the exact same way for 700 customers on a Tuesday. Piercings? We generally don’t trust people who work in the restaurant industry who don’t have them. That may sound crazy, but it’s worked pretty well for us over the years. Everyone concentrates on the food and, for the most part, customers and staff alike enjoy the experience. So much so, that sometimes people stick around for quite a while. After eating here a few times, and much personal introspection, Bryan and Angela moved from the tech world of Silicon Valley to the slower pace of Asheville in late 2011. Without much restaurant experience, they got a crash course in everything 12 Bones, learning every position from the dish pit to the smoker before taking over as owners. What can we say? 12 Bones seems to inspire a certain sort of devotion. So it is with Chef Shane Heavner, who was raised about an hour away from here. He learned to cook from his great aunts and further honed his education at the Asheville-Buncombe Technical Community College Culinary Program at age 30. He joined the 12 Bones family in 2008 and became an integral part of everything we do around here. Many recipes in this book, in fact, belong to Shane. We hope you enjoy this cookbook. It will at least answer the question of the spice in the cornbread. It also may just save you from the disastrous experience of shipping ribs. Oh, and don’t take our treatise on ’cue as gospel; make sure to experiment a little with the recipes, yourself. That’s how we got here, after all.